The Twenties were roaring, and Cornhusker football was making noise of its own. Nebraska had won or shared the Missouri Valley title 12 times in 15 tries. The school boasted a big, new stadium. 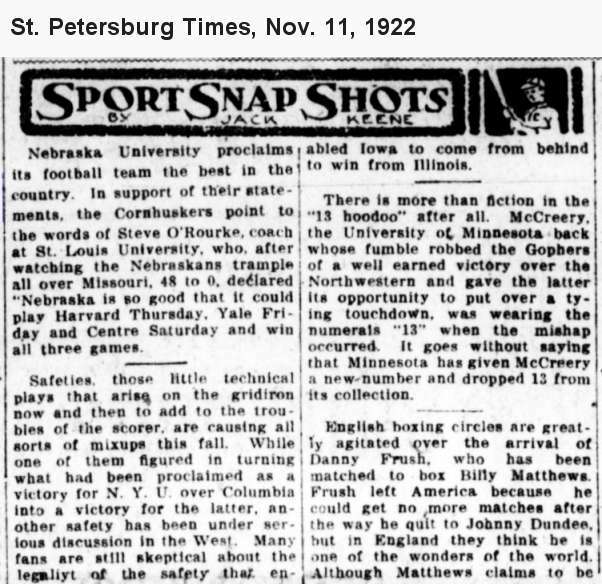 The high-scoring Huskers of the early 1920s had turned some heads, and so had a pair of wins over Notre Dame – the only losses for Knute Rockne's Fighting Irish in a four-year stretch. The thinking in Lincoln was that a step up in the college football world was in order. Would the Big Ten, known more formally as the Western Conference, deem Nebraska worthy of its prestigious club? The answer was no. On March 14, 1925 – the same day Walter Camp died – the Big Ten buried the notion of becoming twelve. The membership applications of Nebraska and Michigan State, submitted three months earlier, were denied. For Nebraska, it wasnt the first time a courtship with the conference hadn't worked out. In 1902 and 1903, the league turned away the unafilliated Huskers and Notre Dame. In 1907, as the Missouri Valley conference was forming, NU yearned for the Western Conference's bigger stage, and a year later the Huskers chances for admission looked good. But the league stood pat, and subsequent bids by Nebraska for entry – including ones in 1913 and around 1920 – also left the Huskers on the outside looking in. Even after the 1925 rejection and the birth of the Big Six three years later, talk of a Nebraska move popped up intermittently over the next two decades. (Yes, sometimes there's a kernel of truth to a Texas bazillionaire's trash talk.) 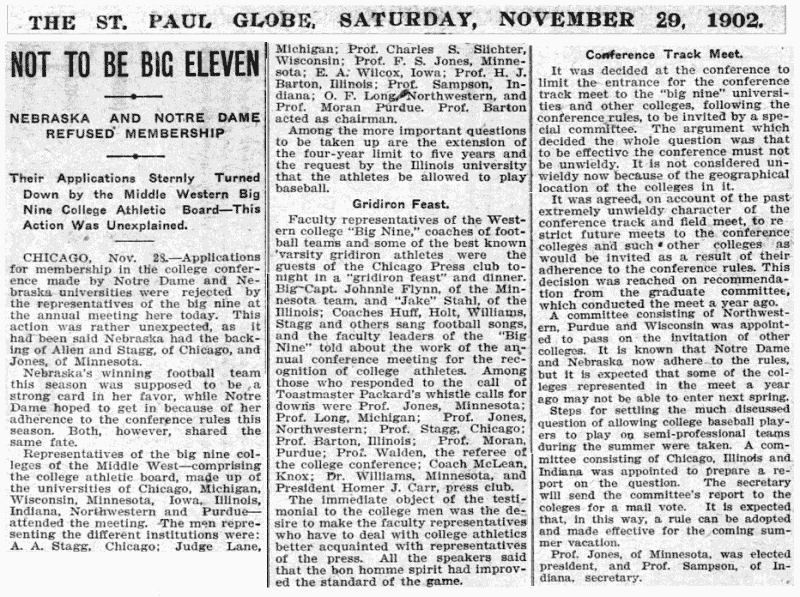 In 1933 came serious consideration of a merger between the Big Ten's Northwestern and Chicago. Which school might step in to keep the league from being whittled to nine? Speculation revolved around Notre Dame, Michigan State, Marquette and Nebraska. As it turned out, the Northwestern-Chicago merger didnt happen, but Chicago's athletics entered a downward spiral. The Maroons' football program, once the proud product of coach Amos Alonzo Stagg, was in its death throes by the 1939 season, and talk of Nebraska joining the league again surfaced – even though NU was said to be satisfied with life in the Big Six. Chicago pulled the plug on football after the 39 season, but it wasnt until 1946 that the school withdrew from the Big Ten, creating an opening. Nebraska, which was one of at least half a dozen schools mentioned as possible replacements, expressed interest but filed no application. Michigan State and Pittsburgh submitted formal applications, and the conference eventually made the Spartans its choice. After that, six decades would come and go before a tumultuous few weeks changed everything. On June 11, 2010, what might have happened generations ago finally came to pass.